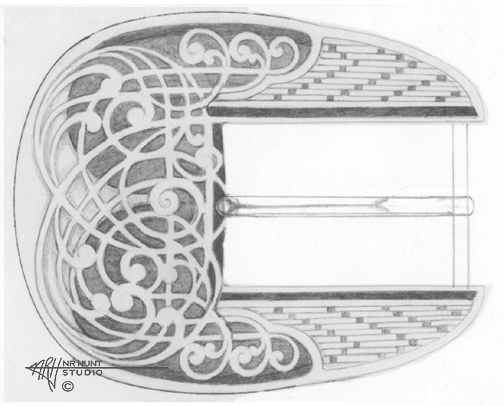 This belt buckle design was inspired by old Persian architecture. At first glance the design seems symmetrical, but as Neil often does, he added a "twist" in the scrolls and approximated the symmetry. The simple and elegant filigree scroll-work stands out sharply against the darker background adding a sense of depth. This is contrasted against the pattern on both sides of the buckle opening, which is from an ancient brick-laying pattern from North Africa. The whole buckle would be done in deep relief and finely textured. There is also always the potential of adding gold inlay or overlay. This buckle design could be made as a buckle only, or it could be made into a 3 or 4-piece set. Some women like an individual larger buckle, while men may want a smaller whole set. It would be a very fine piece, either way. Pricing for Hand Engraved Belt Buckle or Set, "Morocco"